I receive various Seminary Journals (and usually read them). I don’t always review them as I might a book (though they are often more profitable) nor am I, by mentioning the Journal, endorsing the Seminary. This issue of the Detroit Journal is worth ordering and reading. 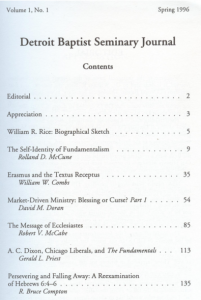 The first article by Rolland McCune (Seminary President) is titled, “Doctrinal Non-Issues in Historic Fundamentalism.” These are things that historic Fundamentalists have always differed on: Bible Versions, Texts, and Text Types (the longest of the treatments); Calvinism and Arminianism; Denominational Distinctives and Polity; Premillennialism and Dispensationalism; The Moral Efficacy of the Physical Blood of Christ; Lordship Salvation. Another article by David Doran is, “Market-Driven Ministry: Blessing or Curse?” Though heavily Calvinistic, this is a good and precise look at the ongoing (and unbiblical) use of marketing techniques to build churches. He evaluates men such as Barna, Warren, Dobson and Leith Anderson and praises evaluations by men such as MacArthur, Horton and John Piper. Another article by William Combs is, “The Preface to the King James Version and the King James-Only Position.” Combs, Professor of New Testament, shows that the King James Version translators were not King James Only men, fighting to have their own translation accepted and encouraging further translations and revisions. He writes, “However, the translators of the KJV recognized that all translations, since they are done by fallible men, are not perfect and can indeed be improved.” In addition the original Preface is printed in its entirety.